Naim NDX review | What Hi-Fi? Traditionally, Naim has never liked to be first at anything – and rather than a negative, this strategy has always been something of a point of pride for the company. It likes to wait for the market and technology to settle down before wading in with what invariably turns out to be a well thought-out product. The company's approach has been a little different when it comes to computer audio and streaming, however. The massive investment in NaimNet – the brand’s high-performance multiroom audio systems – has given the company a running start when it comes to such products. We’ve already reviewed and been impressed by all-in-one system offerings such as the UnitiQute. Now it’s the turn of the NDX media player. What exactly does the NDX do? The term 'media player' sounds vague at best, so what exactly does it do? A media player can draw music from multiple sources. If it’s connected to a home network it can stream music files from any UPnP (Universal Plug and Play) server or hard-drive. While a wireless connection is possible, we suggest the robustness of a wired link would make it the network connection of choice. The NDX will stream most file types up to a resolution of 24-bit/192kHz, and will also handle Apple Lossless; it's a file format usually ignored by most non-Apple products. Connection is swift and the Naim navigates menus and folders with impressive speed. Provided the network is connected to the internet, the NDX can access internet radio. That opens up a world of music (albeit one usually made up of low-quality streams). But this player makes the best of things and remains listenable even with poor-quality stations. Connect an Apple iPod or iPhone to the front panel USB input and the NDX will stream data digitally from the portable, including lossless files. The digital-to-analogue circuitry in the NDX bears more than a passing relationship to that used on the company’s Award-winning standalone DAC, so it’s no surprise the sonic results far surpass those possible using the Apple device's internal conversion and analogue circuitry. The NDX’s high-quality internal DAC also means that connecting digital sources to one of its three inputs – BNC, RCA and optical – will improve on the performance achieved by all but the priciest of digital equipment. So, how does the NDX sound? In a word, excellent. It’s arguably the best sounding media player we’ve come across to date. Remember that this is a relatively new product category and we fully expect performance to improve and prices to drop as time passes. There’s something refreshingly familiar about the NDX’s sound. It’s fast and tuneful in the manner of Naim’s best products. Fed uncompressed files of music as diverse as Cat Stevens’ Father and Son to Rihanna’s Loud and Mahler’s Symphony No.2 the Naim invariably delivers an energetic, informative and cohesive sound. Uniquely among the media players we’ve heard to date, this product reproduces the nuances of timing extremely well. It latches on to the rhythm track of something like Seven Nation Army from the White Stripes and doesn’t let go until it’s squeezed the last degree of entertainment from it. Strong dynamics and a top-class sonic stability go hand in hand with this excellent timing, which all keep everything in place even when the music gets demanding. Switch to higher-resolution recordings such as Beethoven’s Piano Concerto No.5 by the Scottish Chamber Orchestra – a 24-bit/96kHz recording – and the increase in subtlety is readily apparent. Dynamic swings are more fluid and low-level information such as the venue’s acoustic character is easily heard. Spend this much money on a media player and it’s recordings like this that really let you feel their true value. 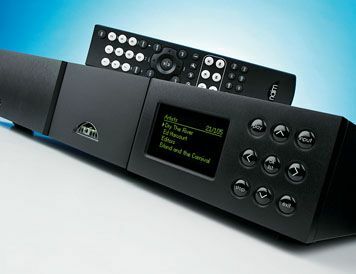 Like most Naim products, the NDX is easy to upgrade. You can add outboard power supplies and standalone DACs, should you wish. We tried the range-topping 555PS power supply and the NDX’s already impressive sound takes a giant stride forward. The NDX/555PS combination sounds massively more authoritative than the NDX alone. The soundstage becomes significantly wider and dynamics take on a far larger scale, while the resolution of subtleties gets even better. Adding an outboard DAC makes sense only if they're at the same quality level as the likes of Naim’s own unit or Cyrus’s DAC X+ with PSX-R. Either of these will add another £2000 to the bottom line. Even after hearing the improvements, though, we think the NDX remains an exceptionally fine listen on its own. We certainly wouldn’t be inclined to rush into any upgrades if we owned one. Media players such as this live or die by their ease of operation. The NDX is relatively quick-witted and has a well-thought-out remote handset. Our preferred option, though, is to use the free n-Stream remote app on an iPad or iPod Touch/iPhone. It makes operation far slicker. We’re convinced that media players such as the NDX will ultimately replace the CD player for many people. Along with the Bryston BDP-1 and Meridian Control 15, the Naim NDX shows it’s a change hi-fi buffs should relish, not fear.